In the week leading up to the Dousman Duathlon, Rose and I probably checked the weather forecast at least twice a day. Meteorologists were forecasting buckets of rain, but we were hoping it would end before the race Sunday AM. Not that a couple of us old cross country veterans were getting soft in our elder years, but we do appreciate dry races. Well, we didn’t luck out. We got up to Dousman Saturday afternoon in fairly good spirits. We had left record rainfall in Chicago for clearing skies in Wisconsin. Unfortunately, that didn’t last long. We picked up our packets, drove the course, and went to dinner with friends. By the time we left the restaurant, it was starting to sprinkle. When we woke up in the morning, it was a steady downpour. Oh, well, at least it was rainy and 60 degrees F, not 40! Rose and I were racing the relay. She would run the first 2 miles, I would bike the next 20 miles, then she would run the final 2 miles. Considering I only had to wait about 10 minutes in the rain for her, and she would have to wait about 50 minutes for me, you would think I had it easier. Not really. 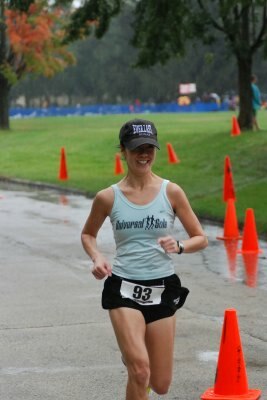 Running in the rain is a lot more enjoyable then biking, especially on a technical course. Rose kept pleading with the night before to take it easy on the corners, because she didn’t want me to hurt my clavicle again. I told her that wasn’t a problem considering how chicken I was in dry weather the week before during the TTT. Besides, we were just doing this race for fun, right? It’s hard for a couple of people who are used to winning races, to just “take it easy”. We know what it’s like to be at top form and cross the finish line first. Our fireplace mantle is covered with enough trophies and medals to make most martial arts schools jealous [Ed note: While Rose has more hardware then me, I’m still faster]. Let’s face, we both wanted to win and knew we could, even if we didn’t really talk about it. 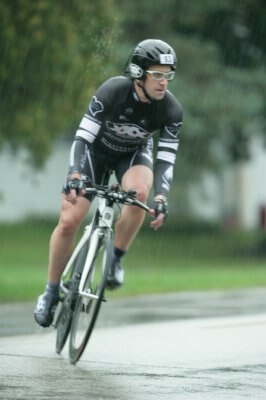 Despite the rain, the duathlon had about 600 racers out of over 800 registered entrants. Like most multisport races, people started in waves. Rose was in the second wave of runners, so I knew I wouldn’t have many people on the bike course. After Rose started, I hung out in the transition area stretching next to my bike. There were a few other relay teams, including one guy who had brought his trainier into the transition area and was spinning to stay warm. Damn, why didn’t I think of that! Rose came through as about the 20th runner out of the first 2 waves. I was pretty excited, since that put us in a good overall position and I knew she’d be even stronger on the final leg with her current training levels. Starting the bike was quite interesting. I took it easy to get me legs warmed up, and my brake pads weren’t working at all on my ZIpps in the rain. I settled into a tempo pace and focused on passing the solo racers who were using the first few miles to refuel for their bike legs. The bike course ended up being about 21 miles and was absolutely beautiful. It followed narrow township roads, through rural farms and subdivisions. Lots of turns and rolling hills. Just as you powered up one hill, you’d have a blazing descent followed by some tight turns. I was riding my Isaac TT bike with a disc, because there were enough flat stretches. However, a standard road bike would have been better for much of the course. I was moving along pretty well and passing other riders. I had one younger guy from Mesa Cycling on a relay team fly by me at about 28 MPH, but I knew his runner was slower so I wasn’t too worried. My mind was so focused on the riders and road, that I didn’t bother with monitoring my PowerTap. I was having fun (sort of). I wasn’t in the typical TT pain I face, but I wasn’t going easy. The rain and technical features made this course fun. The 20 miles went by quicker than they would in most races, but they still took a toll on my body and could feel the fatigue the last couple of kilometers. I came into the last transition trying to figure out what to do. It was a good 100 yards from the dismount area to our handoff spot, and I did not want to walk with my bike (we couldn’t ride through the transition). Well, it’s CX season. I hopped off my bike, shouldered it, and ran through the transition area. Rose grabbed the chip and took off. At this point we were probably about sixth overall. I quickly checked my PowerTap. Amazingly, I had averaged 24 MPH, which I knew would be one of the faster bike legs but there had been faster cyclists and we needed a strong run from Rose to place well. I threw on my rain gear and went to watch the finish. The first couple of guys crossed the finish line, but I knew they were solo racers. Then Rose came in. I think the announcers were completely amazed that it was a woman. They thought she was the first solo female, not a relay member. She had run the fastest second leg of the day. Even as a relay runner, she received tons of compliments for her fast finish. We were both happy to have placed so high and were pretty sure we were the top relay team. were really excited during the ride home. Not only had we done well, but the Dousman Duathlon was a wonderful race. The staging area had ample parking and bathrooms and even had pancakes after the race. The race staff and volunteers were friendly, and they deserve huge kudos for spending their Sunday morning in the rain. After having done USAT events, and experienced multisport sticker shock, it was nice to do a lower key event with a very Wisconsin attitude. We both look forward to doing some more of these in the future, especially now that we have a title to defend. When we got home, we anxiously awaited the results being posted online. Thankfully, prelims were posted later than night. We had finished third overall and were pretty sure we were the first relay team. Sure enough, the official results confirmed our victory a few days later. Not bad for our first relay together. Previous Post: Hup, Hup, Hup!! !